Grand Announcement #2! « I'd rather be in France. The second big announcement of the week is that Steve and I are going to have a change of scenery very soon. Although I have loved living in Capitola and Santa Cruz the past year, the truth is that there is a much more promising market two hours north of here. Sonoma Valley already attracts a large number of people who love good wine. We suspect that many of them also appreciate good food. When Arthur and I were on a scouting trip a couple of weeks ago, we had lunch at a successful California country restaurant located between Sonoma and Napa and found ourselves surrounded by young professionals from San Francisco who had driven up for the day to enjoy the scenery, wine, and a bite to eat. Also in Sonoma County is another city, Petaluma, that is already the home to a number of breweries and other food-related companies. The sources of fresh ingredients are plentiful, and we will certainly benefit from being in a community of other culinary entrepreneurs. And, of course, all of this is conveniently located less than an hour north of a few other cities within our sights, such as San Francisco, Berkley and Oakland. A small number of you might remember that I originally had my heart set on living in French wine country, and it was a trip to Napa and Sonoma that made me decide to move to California instead. Once again, the vineyards are calling, and I look forward to my daily commute through the rolling hills of Sonoma County and the north end of San Francisco Bay. I also look forward to see you when you come and visit! This entry was posted on January 28th, 2013 at 11:02 pm and is filed under The Business Of Business, What's this all about?. You can follow any responses to this entry through the RSS 2.0 feed. You can leave a response, or trackback from your own site. You menu should include shrimp and grits. 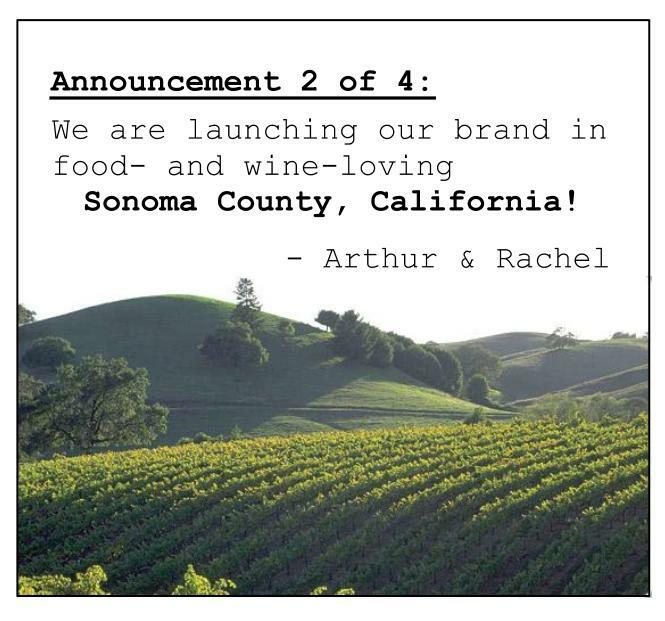 Sonoma has been on our “to visit” list for a while…I’m glad that there will be a familiar face when we finally make it there! And I love the announcements! The suspense is delicious! Yes! You should definitely visit beautiful Sonoma and definitely let me know when you do :-) But be warned: you might love it so much you drop everything and move like I did.